Inconsistent and Unpredictable: It's Progress! 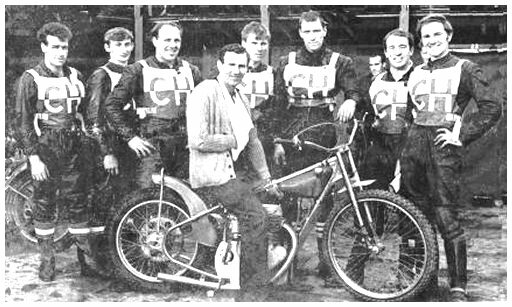 1968 can generally be remembered as the year that Cradley finally came together as a team but lost their star man. Pre-season team building went well and the Heathens again started the campaign with one of the strongest looking line-ups on paper. On bike: - Ivor Brown. Ivor Brown, Chris Julian, Tommy Bergqvist, Graham Coombes and Ken Wakefield were all welcomed back from the previous season, but two significant additions made all the difference. The major two signings of the winter were Bob Andrews and Roy Trigg, both capable scorers and genuinely nice guys, and they slotted in perfectly at Dudley Wood. With these seven and back-up at reserve from Alan Totney, Pete Wrathall and Archie Wilkinson, Cradley made one of their best starts to a season. Rising to fifth in the league table at one point, they looked solid and strong for the first time in the top flight. Both Andrews and Trigg were regularly topping the scorechart, the Heathens were looking powerful at home and were even turning in the occasional away win, including hard-fought victories at Oxford and Swindon. Tommy Bergqvist seemed to be the only casualty of the summer, with a succession of injuries taking their toll on the Swede. He returned to Scandinavia to be replaced at the Wood by fellow countryman, Lars Jansson, who settled well. However, the turning point of the season came at the end of August. Cradley took on Oxford at Dudley Wood on the back of a thrilling two-legged victory in the Dudley-Wolves Trophy. The Heathens first lost Jansson from heat one, who in turn lost the tip of one of his fingers; In the same incident the Cheetahs saw their number one Ronnie Genz rushed to hospital with a fractured skull. The devastating blow for Cradley came later when Ivor Brown took a heavy tumble and broke his ankle. Brown was already returning from a damaged shoulder but the latter accident brought an abrupt end to his majestic career at Dudley Wood. Two home defeats followed and the team couldn’t muster another away win for the rest of the season. In a close finish to the British League, the Heathens slipped to a relatively disappointing 14th, and yet were just ten points behind eventual champions Coventry. And despite not managing to fulfil the promise of the early-Summer heights, it was a season of certain progress. There was no doubt whatsoever thatIvor Brown would be sadly missed from the Cradley line-up, but there was also visible signs that Bob Andrews and Roy Trigg were vital pieces of the jigsaw in turning the septet of Heathens into a real team. Bob Andrews 7, Roy Trigg 7, Tommy Berqvist 6, Chris Julian 5, Pete Wrathall 5, Ivor Brown 3, Graham Coombes 2, Ken Wakefield 2. Roy Trigg 12, Bob Andrews 6, Chris Julian 5, Graham Coombes 4, Ken Wakefield 4, Pete Wrathall 1, Tommy Berqvist 0. Roy Trigg 10, Lars Jansson 7, Ivor Brown 6, Bob Andrews 6, Graham Coombes 5, Chris Julian 3, Pete Wrathall 0. 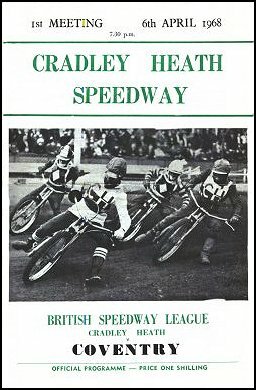 Cradley again hosted a club international against Prague, Czechoslovakia and won 51-27. Bob Andrews 16, Roy Trigg 12, Chris Julian 8, Graham Coombes 8, Lars Jansson 8, Ivor Brown 5, Pete Wrathall 3, Alan Totney 2. Bob Andrews 14, Graham Coombes 10, Roy Trigg 9, Lars Jansson 7, Pete Wrathall 4, Ivor Brown 3, Chris Julian 3, Alan Totney 0.